You know what? I think it's time to stop laughing at Nokia. The clichéd joke is that it's tech's most famous has-been, a firm that peaked with the 3310 and has nothing else to offer the world other than nostalgia about how your dad "still uses his old Nokia!". And after Microsoft bought Nokia's mobile division, and then swiftly gave up on making phones, it seemed like that was it for Nokia as a consumer brand. But what Microsoft left behind in Finland, a country which once oozed with pride over Nokia's success, was a bevy of bright engineers and strategists. Nokia isn't going away, and it surely once again deserves the tech world's respect and attention. Let's start with its most recent acquisition: Withings. Withings is a French digital health company that holds the accolade - if you ask me - for producing the only smartwatch on the market that isn't grossly offending to your eyes. Another of its products, launched just this week, is its smart weighing scale. There are a few of these on the market, but Withings/Nokia's scale is the only one that measures your "pulse wave velocity" (PWV). I hadn't heard of it either, but I'm told it's a measure of how blood is moving around your body. A key metric for measuring your cardiovascular health. 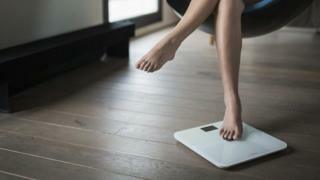 Nokia's recently-completed purchase of Withings cost the firm peanuts - €170m ($191m; £133m). The sort of amount you'd imagine Facebook finds down the back of its sofa. For that money the company has essentially bought a ready-made digital health division with an impressive, sleek array of products and the promise of more to come. I'm writing this in the lobby of Nokia's new San Francisco office, the new home of Nokia Tech, the firm's innovation wing. Cedric Hutchings - formerly Withings chief executive, but now Nokia's head of health - told me joining Nokia gives them the chance to expand rapidly. He has lots of ideas and needed Nokia's money. Nokia's other big focus is virtual reality. Of course, that's a crowded space. Next week I'll be at E3 looking at virtual reality gaming, and the roster of companies producing hardware is huge - Oculus, Sony, HTC, Microsoft, Samsung… you can't move for VR gear. But Nokia is taking a different angle. Its focus has been on making the best virtual reality camera. No easy task - you need to film a complete 360 degrees, and provide the ways and means to stick it all together. Facebook's attempt at this looks like some kind of angry robotic ET - but Nokia's Ozo is a neat little orb. "We are taking a risk, but we think it's worth it," said Ramzi Haidamus, president of Nokia Tech. "Virtual reality puts us on the market as the most innovative company in that space." Patience will be a virtue here. Despite a lot of excitement, VR is still a revolution-in-waiting. Mark Zuckerberg has said he expects it will take several years to know if the VR headsets will be a success. For Nokia, the wait will likely be even longer. "Yes it's a gamble," Mr Haidamus agreed. "But it's such an exciting space and we're in year one of many years to come." The Ozo costs $60,000 - but if Hollywood is on the brink of getting excited about VR, that's a target market ready and waiting to pay that kind of money. If VR is the next tech gold rush, you could say Nokia is the company with the best shovel. If it comes off, the ones laughing will be Nokia - all the way to the bank. A tech comeback few might have expected.